The old adage ‘you play like you train’ is never truer than when applied to athletics. Think about it: every other sport your kids are involved in requires them to turn up at least once a week for practice, so that they’ll be up to the challenge come Saturday/Sunday morning games. Running, jumping and throwing are no different—the more you put in on the training track, the better you’ll perform on match day. At BLAC, we’re all about personal development and enjoyment. We invite your athletes to come down to Dendy Park during the week to receive top quality coaching from experienced coaches and pro athletes. We’ve really ramped up the coaching and training in the past couple of years and we’re hoping more athletes will take advantage of the quality coaching on offer. Midweek training isn’t compulsory, but we can honestly say it makes a big difference. We also want to dispel the myth that training is only for elite athletes—the fastest runners, longest and highest jumpers, or strongest throwers: It is for anyone who wants to develop their technique and performance in particular events—who seek personal improvement and to enhance their enjoyment of athletics. We want to encourage participation and improvement. Training days are also a vital part of building camaraderie and team spirit among athletes. Athletics is for the most part an individual pursuit. By attending training midweek, your athlete will have a great opportunity to forge new friendships whilst pushing each other to greater heights at the same time. Most disciplines are covered both at Saturday competition and during the week. See below for details of training days. When & where is coaching? 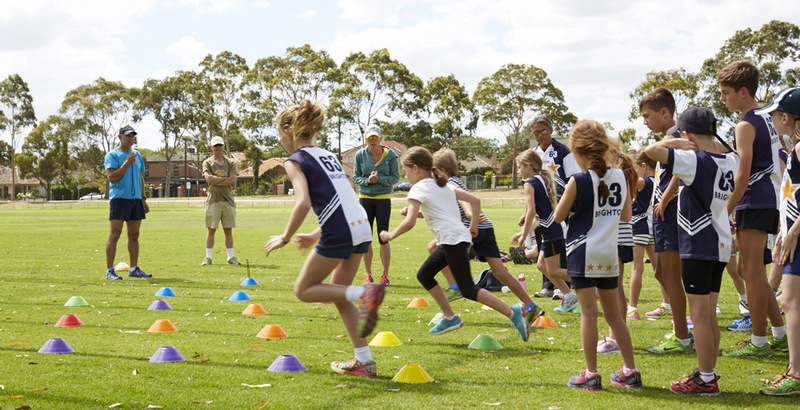 Coaching is provided at the top oval at Dendy Park – our usual competition location during summer. This year we are excited to introduce a dedicated middle distance training session. Rupert van Dongen, a coach with more than 20 years experience with athletes ranging from national champions to little athletes, joins us to train our athletes for 800 metres and 1500 metres events. Rupert will be running a training session each Monday between 5pm and 6pm. We encourage athletes competing in under 10 and above to come to Rupert’s sessions as these are the age groups that participate in middle distance events of 800 metres and longer. Rupert will also be working with any athletes interest in race walking. Tuesday is field day, with training from 5.30pm onwards. High Jump starts at 5.30pm, while Long Jump / Triple Jump and Discus / Shot Put start at 6pm so athletes have the opportunity to train for all of these events in the one session. We have experienced coaches: Olympic shot putter Damian Birkinhead is our throws guy; Brett Lewis, a veteran of the Brighton Little Athletics coaching team, is again taking long jump and triple jump; and John Crane, who is president of the Australian Track and Field Coaches Association (Victorian branch) and has more than 40 years coaching experience, joins us this season to take high jump training. Throws training will include discuss, shot put and javelin. Thursday is track day, with training for sprints starting at 5.30pm and Hurdles at 6pm sharp. Laura Bainbridge, a former Brighton Little Athlete herself is back for her second season and will be on deck for sprints training. Allan Poynton, BLAC’s longest-serving coach, kicks off hurdles training at 6pm sharp. Sunday afternoons are for relay training. BLAC veteran Cameron Tampion is heading our relay sessions and will be masterminding the baton changes on Sunday afternoons from 4.30pm as we prepare our teams for the Southern Metro Region relay championships in November. The best thing about relays is that a sport that is a very individual pursuit suddenly becomes a team concern. BLAC is an active participant in regional and state relay championships and we have a proud history of sending many teams and snaring some excellent results with our relay teams. We encourage your kids to join in the team spirit. We need more coaches and parent participation! As you can see we have excellent roster of experienced coaches. However, we are always keen to get more people involved. All parents are encouraged to support the athletes on competition days, but also to help out on training days. The most important attributes we’re looking for are enthusiasm and commitment (a bit of kid-wrangling skill comes in handy too!). If you really want to take it up a notch and get yourself qualified, we can arrange for you to attend an Introduction to Coaching Course (ITCC), which Little Athletics Victoria schedules regularly during the season. We’ll even pay for you to become a coach! All practical .... No exam .... No previous experience necessary!